Is it possible for ethical thinking to be grounded in pure reason? In this bold and innovative new work, Adrian Moore provides a refreshing and challenging look at Kant's moral and religious philosophy and uses it to arrive at a distinctive way of understanding and answering this question. 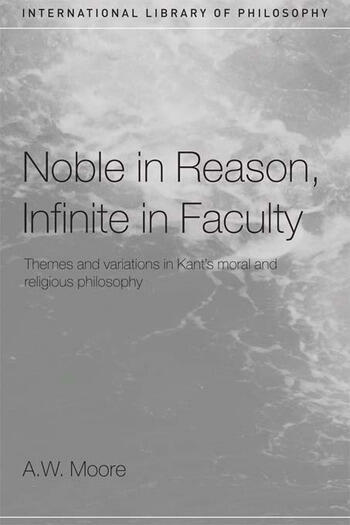 Noble in Reason, Infinite in Faculty identifies three Kantain Themes - morality, freedom and religion - and presents variations on each of these themes in turn. Moore concedes that there are difficulties with the Kantian view that morality can be governed by 'pure' reason, but defends a closely related view involving a notion of reason as socially and culturally conditioned. In the course of doing this, Moore considers in detail ideas at the heart of Kant's thought, such as the categorical imperative, free will, evil, hope, eternal life, and God. He also makes creative use of ideas in contemporary philosophy, both within the analytic tradition and outside it, such as 'thick' ethical concepts, forms of life, and 'becoming those that we are'. Throughout the book, a guiding precept is that to be rational is to make sense, and that nothing is of greater value to us than making sense. Noble in Reason, Infinite in Faculty is essential reading for all those interested in Kant, ethics, and philosophy of religion.